I’ll let you in on a little secret. I loathe air travel. Flying across country may save time, but unless I’m on a tight schedule, I’ll choose road tripping over buying a plane ticket any day. I used to think I abhorred flying because I’m kind of a control freak and like being in control. But I’ve mellowed over the years- that’s not it. Then I thought it was the layovers and waiting around. And while I don’t enjoy sitting in a crowded (or empty) airport for hours, that’s not it either. You know what stresses me out when it comes to flying? Two words. Airport Security. It feels like time stands still as you approach the check point then all of a sudden you’re thrown into a tizzy removing your shoes, pulling your laptop and cameras out of your bag, walking through the scanner which for some reason never passes me so I’m faced with the pat down. Then its rush, rush, rush to gather your things, hurry through security and then wait at your gate. But that’s not all. I always struggle when it comes to packing. When I’m flying I need to follow the TSA liquids rules. But should I pack my toiletries in my carry-on or checked luggage? How many liquids can I pack and be in compliance with the TSA rules? You can read all about that on the airline website but I found a TSA compliant product that is guaranteed not to leak and takes the stress out of what to pack. 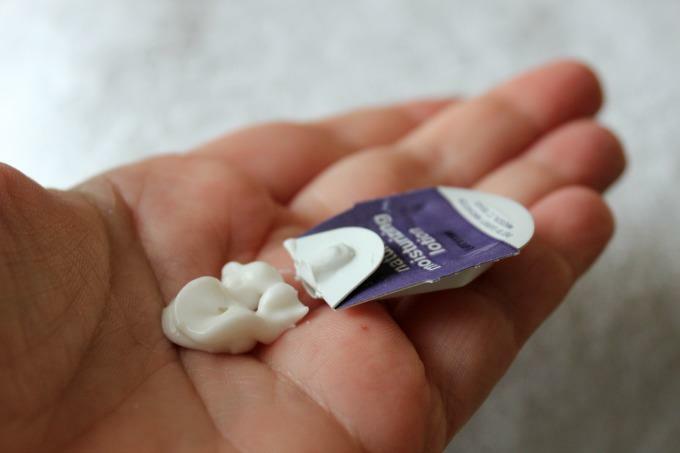 Allow me to introduce you to Squeeze Pod- single-use pods filled with shampoo, conditioner, hand purifier, moisturizing lotion, body wash, hair gel, and toilet odor eliminator. The Squeeze Pod products are all-natural and safe for the entire family. 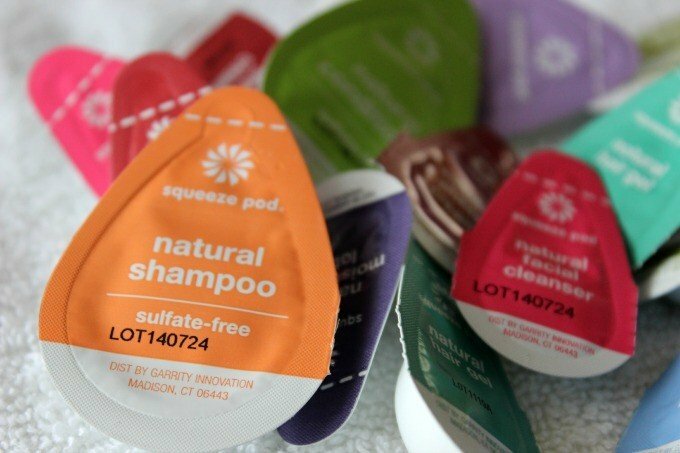 The makers at Squeeze Pod kindly sent me a few samples of their products so I could try them and share what I thought. When they first asked me if I wanted to try their products, my initial response was no. But then I spent some time on their website and one product really struck me as ingenious; natural toilet odor eliminator. When I travel, the last thing I want to do in a crowded or inflight restroom is go number two. Seriously. Elimination may be natural, but who wants to walk into a stinky restroom? Not I. Use these and the folks who enter the bathroom after you will thank you. What if you’re not a Frequent Flyer? 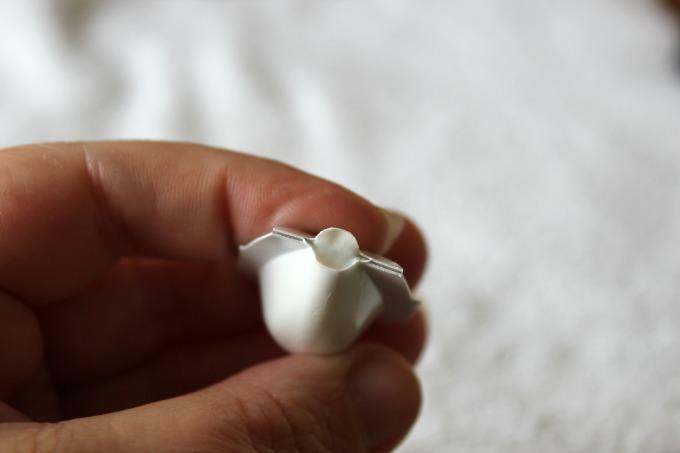 Squeeze Pod is convenient for flights but that’s not the only time you’ll want to use these. My husband travels frequently for work and I often join him. It’s a quick road trip for me and time in a hotel room while he’s working means I can get some work done. I packed a couple pods and hit the road. I was pretty convinced that though I may like the products, I wouldn’t love them. And then I tried them. 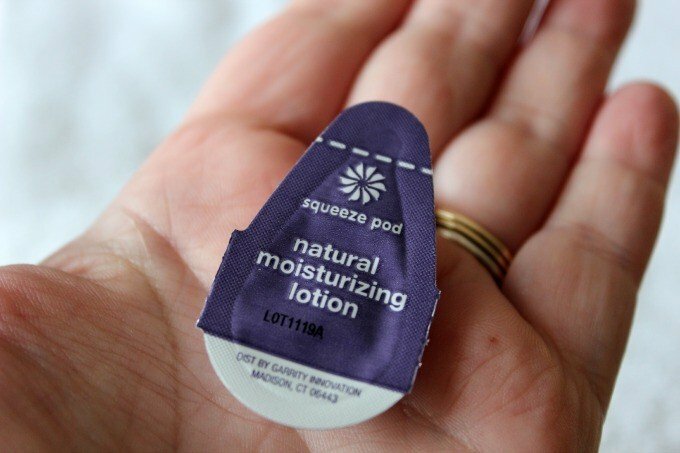 All I can say is Squeeze Pod, where do I buy full-size products to use when I’m at home? I’m pretty particular with my shampoo and conditioner choices. My hair is color treated and though it’s not naturally curly, it is very thick and has a lot of body. If I use the wrong products I can count on my hair frizzing up and I look like a puff ball. That said, I really liked the Squeeze Pod shampo and conditioner. Even with wet hands in the shower it wasn’t difficult. There was plenty of product in each pod for my thick, just below my shoulders hair. The product left my hair soft and manageable. I also used the hair gel but unlike the shampoo and conditioner, there was not enough gel for a single use for my hair. When I use product I goop on the product. It was the right size for my son’s military cut but not my hair. I also didn’t find one pod of shaving lotion to be enough to shave my legs but for a man’s face, there would be plenty. Besides, shaving lotion isn’t something I normally use but since it was in my kit, I thought, why not? As much as I liked the shampoo and conditioner, it was nothing compared to how much I loved the natural facial cleanser. Yes, I said I loved it. My face felt incredible after I used it. My Squeeze Pod set came in a clear toiletry bag that adheres to the TSA 3-1-1 rules for carry-ons. All liquids and gels must be 3.4 ounces or less per container and must be in a 1 quart-sized, clear, plastic, zip-top bag; one bag per passenger. Each bag can hold up to seven days’ worth of Squeeze Pods. Squeeze Pod single-use pods are made in the USA, PETA approved, and vegan and made from all natural products. 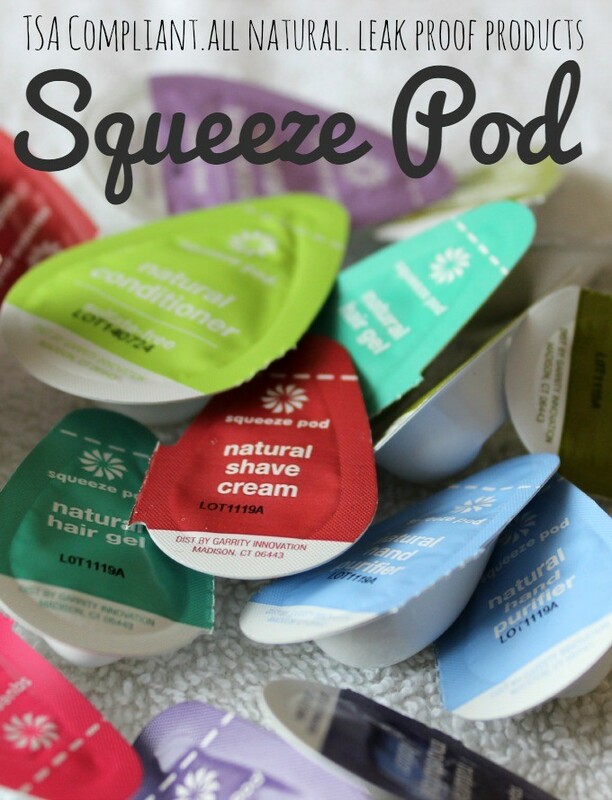 Want to give Squeeze Pod a try? 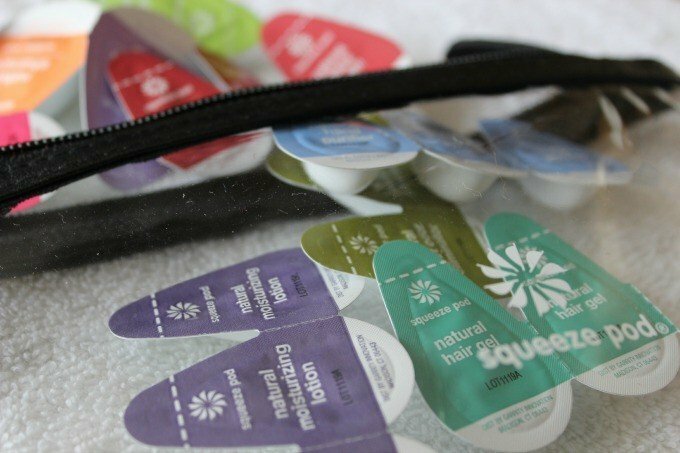 You can learn more about Squeeze Pod, view their full line of TSA Compliant products, and place your order here or at SqueezePod.com. Follow Squeeze Pod on Facebook for new products and updates. Have you tried Squeeze Pod? Seems interesting … might have to try it on my next trip! Our bathrooms and got rid of the sprays. Squeeze pod smells wonderful. I even use them in public restrooms to cover up lingering odors from previous user. I hate that smell!! Even if I quick in the restroom I use it just to make it smell better in there! Thanks so much for sharing about this awesome product! 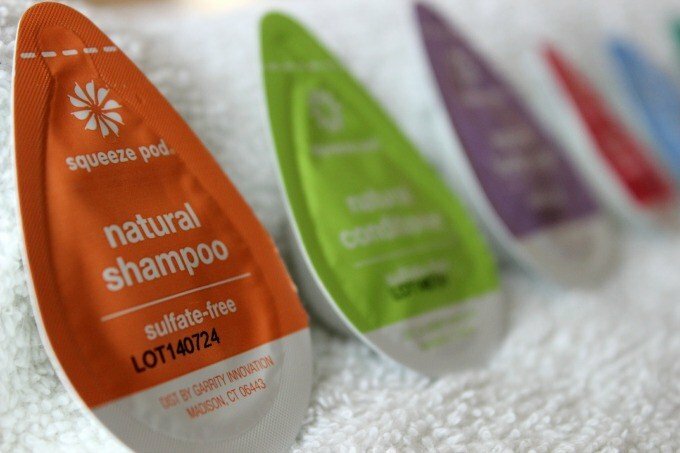 Love all the squeeze pod products. I’m so happy to hear that they work well for your needs. I placed an order for more product this week. I can’t wait until it comes in!